Evergreen Apple Nigeria will be presenting a new look and feel for the company at this year’s European Business Aviation Convention and Exhibition (EBACE). It will be announcing a new name, “EAN Aviation” and promoting a revamped brand to exhibition attendees on the AfBAA booth 5542. Initially known as Evergreen Apple Nigeria, the brand refresh has been implemented following an expansion in the type of aviation services offered by the company, and the need to have the name reflect the core business activity. With the clarification of identity, EAN Aviation will be well positioned to continue to develop an internationally recognised aviation business. EAN Aviation launched as a full service FBO quickly developing local, FAA and EASA maintenance capabilities. Executive aviation dining provider Wings Inflight catering followed soon after. At last year’s EBACE the company announced it had signed a representation agreement with Gulfstream Aerospace (a General Dynamics Company) which sees EAN Aviation promoting the sale of new Gulfstream aircraft within Nigeria. Segun Demuren, EAN Aviation’s CEO, initiated the popular annual Nigerian Business Aviation Conference, NBAC, which had its second outing in March this year. The company also arranges aircraft charter services, executive aviation ground handling at Lagos Murtala Mohammed Airport and provides office leasing services in its airport facility. The new logo which was designed by Etu-Odi – a Lagos based advertising agency – is simplified and aims to depict the personality of the new EAN Aviation brand — warm, luxurious, passionate and customer focused at all times. The deep blue colour is a subtle reference to EAN’s personality which aims to be reliable, professional and responsive to customer needs. “We always aim to exceed customer’s expectations and hope the new logo inspires trust and confidence in our offering,” adds Demuren. Etu-Odi has worked with EAN from inception so understands the business and how it has changed. “The team has created a vibrant, professional new style for us and we look forward to presenting it to the delegates” concludes Demuren. 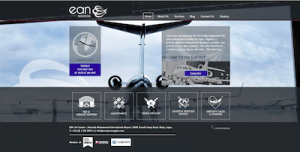 A new EAN Aviation website www.ean.aero mirroring the refreshed design has been launched and delegates attending EBACE will be given stationary also reflecting the new look and feel.